For over 25 years, Sun-North has been manufacturing the complete line of Comfort Control Curtain Systems. 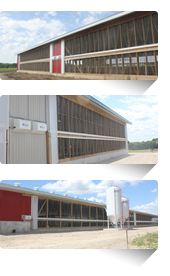 These all-weather fabric curtains can become a moveable sidewall for dairy barns with 50 to 5000 cows. Since all Comfort Control curtains and hardware are made in house, we can offer faster delivery, greater versatility in design and a guarantee of higher quality since it is Canadian fabric and Canadian made. Sun-North stocks an infinite variety of weather resistant fabrics in different colours and weights to suit all of your curtain requirements. If you have a unique building circumstance, it would be our pleasure to provide a customized design and product to suit your specific needs.